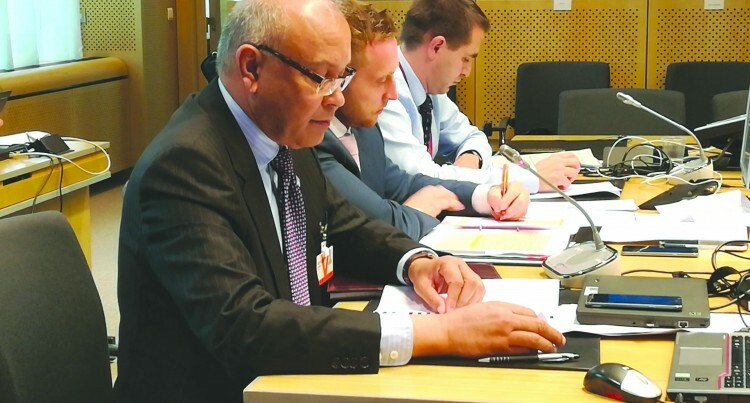 Fiji’s Climate Ambassador and Permanent Representative to the European Union, Deo Saran (left) during the European Heads of Climate Delegations meeting in Brussels. Fiji aims to make the Conference of Parties (COP) 23 a visionary COP and build trust and goodwill and ensure a result that demonstrates her commitment to climate action and solidarity with the most vulnerable. Fiji’s Climate Ambassador and Permanent Representative to the European Union, Deo Saran made the statement while updating the European Heads of Climate Delegations regarding the preparations for the United Nations (UN) Climate Conference (COP23) on November 6-17 in Bonn, Germany. The European Heads of Climate Delegations meeting at Brussels was led by Estonia as the European Union President this year. “We aim for a COP that delivers tangible results and inspires a race to the top of our ambitions in order to limit the rise of global temperature to 1.5°C above pre- industrial level and the implementation of the Paris Agreement,” Mr Saran said. “It is important to reaffirm our global commitment to climate action at this very important time in the history of international climate negotiations,” he said. The European Heads of Delegation found the exchange very useful and reiterated their support for the Fijian COP23 Presidency. “We welcome the fact that this is the first island presidency against the backdrop of extreme weather events around the world today,” Elina Bardram, Director General Climate Action Europe Commission, said. “Your sensitivity to the loss and damage issue will add new flavor to the way negotiations take place,” she said. Fiji is the first island nation to have ratified the Paris Agreement – the only global agreement to combat climate change and it is the first island nation to preside over a UN Climate Conference.